Here's some figures (courtesy of boxofficemojo.com a favorite website of mine). In 1999 the 5 best picture nominees had made an aggregate 521 million dollars prior to the nominations. In 2000 the 5 best pictures had made $471.3 million prior to nominations. not everyone wants to sit through Good Night, and Good Luck or Brokeback Mountain this year...Crash has come and gone and not too many people caught it in the theaters...it too was dark...Munich is dark...and Capote...well it's dark too. I love Capote and Good Night and Good Luck and I imagine in the weeks ahead more people will see them (and Brokeback Mountain has already seen a significant increase in it's box office grosses since Tuesday)...but I want to let you know, there is reason for you not to feel disconnected from the awards at this point. 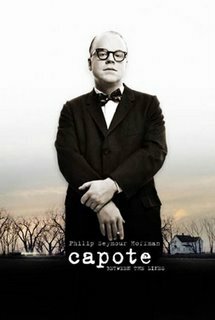 But Capote is expanding to 800 more theaters this weekend, Brokeback is expanding up to 2000 theaters, Munich's picking up more theaters this weekend to...more people will talk about these movies (just as more people talked about Million Dollar Baby when it came out last year and received mega-award attention).